The name of the city comes from Sir Walter Raleigh. It was incorporated in 1792. Raleigh is part of a triangle of cities including Durham and Chapel Hill, all three of which have a major university (North Carolina State-established 1887, Duke, and North Carolina, respectively). Since all three are so close, we visit each campus after the Greenways Conference we attend. 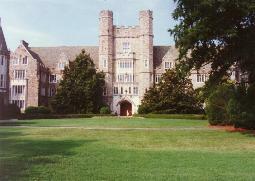 Duke is very Gothic (see photo in the "Research Triangle" section below), with a fabulous chapel. 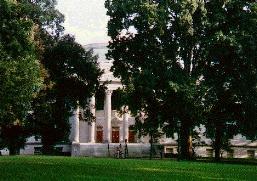 The North Carolina campus is also very attractive (see photo). Other colleges in Raleigh include St. Mary's (established 1842), Peace College (established 1857), Shaw University (established 1865), and Meredith College (established 1891). President Andrew Jackson was born in the city. While visiting the campuses, we also drive through the famous "Research Triangle," home of approximately 40 major hi-tech corporations nestled within a sprawling, 5,000-acre campus-like area of rolling hills and forests. The Triangle was established in 1961. We have a landscape architect with us from Gainesville, who is shooting photos of the entrances of some of the corporations (part of what he does is design industrial parks). At a place called Glaxco (apparently some multi-billion dollar pharmaceutical conglomerate), we are pulled over by security guards who detain us for about 20 minutes of questioning (more like interrogation). We are told it is illegal to take pictures of the entrance of the corporation, and would have to wait for a supervisor to determine what was to be done with us. At one point, two of us remaining in the car thought we would drive by the guard house with the doors open so the other two could make a run for it and enable us to escape from what was sure to be some form of corporate torture chamber. We try to humor them, but they are deadly serious. It is rather disturbing, and quite Nazi-like. We go to two excellent restaurants in Raleigh for dinner, and also see a great comedy show at a nationally-known comedy club. Cruising through the city on one night is disappointing since there were no jazz clubs or dance clubs to be found. Disappointing. In Raleigh, we find the traffic to be congested, and filled with crazy drivers (probably road-raged by both the congestion and the horribly designed roads and street signs-we nearly got into about 17 car crashes). The conference is very informative. In addition to the excellent workshops, we have a chance to tour several of the local greenways, some of which are heavily used by walkers, joggers, and bicyclists. I'm looking forward to bringing more city staff and city commissioners up there in the near future to show them what we could do to transform Gainesville into an idyllic community. In 1990, the Raleigh population was 207,951. It is the 2nd largest city in the state. The legislature decided that a new capital must be located within 10 miles of Hunter's Tavern, and the present site was selected in 1788. General Sherman captured the city for the Union forces in 1865.